Having given up the life of a wayfaring consultant means that I have flown significantly less this year than I had the previous 10 years. While this is most likely good for the environment, it is bad for my status in airlines' frequent flyer and hotels' frequent guest programs. In 2007 I flew enough to get myself status on both Air Canada and Continental airlines, and stayed enough at Marriott hotels to become one of their top tier guests in the Marriott Rewards program. That status has many benefits - upgrades to business class when flying, privilege to board when you like, extra air miles and special offers galore. With very little travel in 2008, I am about to lose all those benefits. I am currently on a world-wind tour of North America, hitting Toronto and New Orleans before heading back to London for what will likely be my last trip of 2008, and therefore the last time I get to wallow in the benefits of having status. 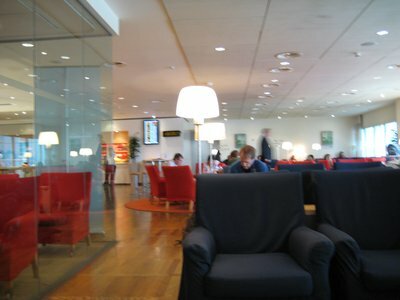 So, to start off my trip right, I hit Air Canada frequent flyer lounge in London. 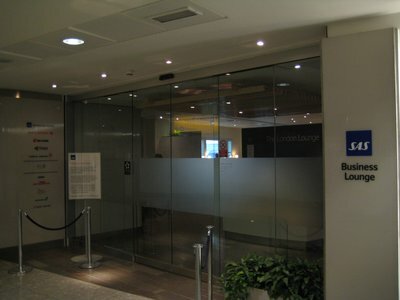 Actually, the lounge is run by Air Canada's Star Alliance partner, SAS. SAS, which stands for Scandinavian Airlines System Group, is a airline and hotel management company headquartered in Stockholm, Sweden. 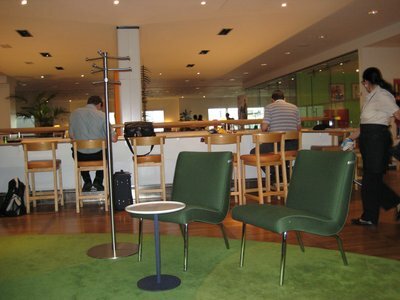 Most business class lounges go for the plushy, leather chairs and wood panelling look, but not SAS. 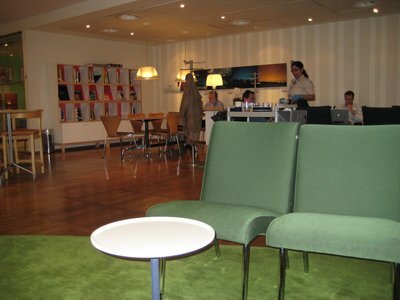 Fitting for a company headquartered in Sweden, their lounge is all hard wood floors, bright colours and modular furniture. It was eerily similar to being in an Ikea showroom. I kept expecting a young couple to come walking through browsing the furniture. "Hmm, if we got two of the KARLSTAD armchairs, a BESTÅ TV stand, a nice KRAMFORS sofa and perhaps a couple MARKÖR end tables, I think that would really fill out the living room." Either way, the beer was cold and free and I could browse the internet for free, so all and all, it wasn't a bad way to start my trip. 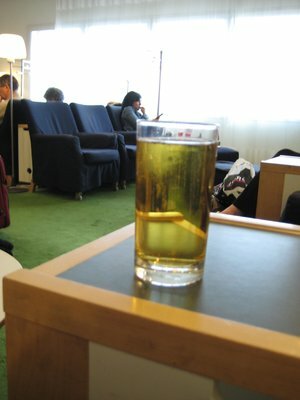 If it makes you feel any better, I don't think I've ever been inside one of the airline lounges. Welcome back to the simple life, where you buy your own snacks and pay for your own booze both on the ground AND in the air. So that's what goes on behind those doors at the airports? Not a scruffy backpacker in sight! Well, there was one scruffy backpacker, though you couldn't see him because he was behind the camera.